Astronaut Paolo Nespoli took this image of the moon aboard the International Space Station on March 20, 2011, and wrote, "#Supermoon was spectacular from here!" Just when we were starting to get over the shock that parts of the moon's surface are wetter than the Sahara Desert, a new study reports that the lunar interior is sopping wet, too. Last October, scientists announced that a crater near the lunar south pole is jam-packed with water ice, likely holding a billion gallons of the stuff. Now, new research has found that the moon's insides are likely as wet as the Earth's upper mantle, the region just below its miles-thick surface crust. This discovery, made by studying pieces of lunar magma hurled to the surface by ancient volcanic eruptions, comes as a big surprise. 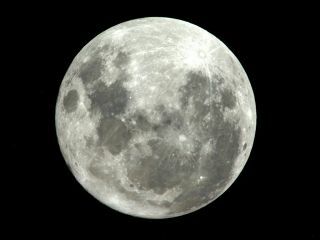 "You really would not expect, based on what we know about this model, to have any water present in the moon at all," said the study's lead author, Erik Hauri, of the Carnegie Institution of Washington. "The fact that these [samples] have terrestrial levels of water is really a stunner." These crystals prevented the magma's water from gassing out during the eruption, thereby largely preserving the original water content of the underground rock. "These samples provide the best window we have on the amount of water in the interior of the moon," study co-author James Van Orman, of Case Western Reserve University, said in a statement. Backscatter electron image of a lunar melt inclusion from Apollo 17 sample 74220, enclosed within an olivine crystal. The inclusion is 30 microns in diameter. So melt inclusions are special. They're also rare, and finding the tiny structures in the small store of moon rocks available to researchers was by no means a given. But co-author Thomas Weinreich, at the time a freshman at Brown University, spotted some while poring over the Apollo 17 samples. Other researchers had found melt inclusions in lunar samples before, but until now nobody had been able to measure their water content. Using a specialized ion microprobe, the team scrutinized seven melt inclusions, the largest just 30 microns across — smaller than the diameter of a human hair. They found water contents ranging from 615 to 1,410 parts per million. Those levels are about 100 times higher than previous studies of lunar magma had suggested, and they're comparable to the concentrations found in the Earth's upper mantle. The melt inclusions also harbored Earth-like levels of chlorine, fluorine and sulfur. "We were really, really surprised," Hauri said. The researchers reported their results today (May 26) in the journal Science. The team's findings don't cast serious doubt on the theory that a gigantic collision created the moon, Hauri said. But the results indicate that researchers' models of this cataclysmic event need a lot of work. The models could be failing in their estimation of the energy released during the impact, according to Hauri. The collision may have been less dramatic than scientists think, leaving some blasted-off Earth chunks incompletely cooked. These pieces may have been able to hold onto some of their water before coalescing to form the moon. But tweaking the energy levels downward wouldn't necessarily explain everything. "Certainly some of this [ejected] material has to have melted, so in that scenario it's still kind of hard to imagine that both the Earth and the moon have the same amount of water," Hauri said. Conversely — and somewhat counterintuitively — perhaps the impact was even more violent and energetic than researchers had imagined. If that's the case, it's possible that the collision vaporized some of the ejected rock, producing a thin but dense atmosphere that kept some water from escaping into space. But this idea is no silver bullet, either, Hauri said. At the moment, it's just difficult to account for the Earth-like levels of water — and chlorine, fluorine and sulfur — in the moon's interior. The new study "requires us to think hard about understanding the giant impact process at a level that's anything more than superficial," Hauri said. Where did the moon's surface water come from? Most scientists think that the moon's prodigious stores of surface ice, which are chiefly concentrated in permanently shadowed craters near the poles, were deposited by comets and asteroids in the relatively recent past. But the new study suggests that some of the stuff may be water from the lunar interior that was ejected by volcanic eruptions. Most of the moon's volcanism took place between 3.2 billion and 3.8 billion years ago. So any surface water originally from the moon's innards would be very, very old. That may be possible, as long as the moon's orientation has remained stable for a long time, keeping the ice-bearing craters shadowed for billions of years. Researchers will likely need a sample-return mission to figure out where the surface water actually came from, Hauri said. "If we had a little of that water back on Earth, we could do some measurements on it that would be able to tell pretty quickly what the origin of that stuff is," Hauri said. The rock samples the researchers studied are deposits formed by explosive volcanism. Similar deposits are known to exist on many solar system bodies, including Mercury, Venus, Mars and the Jupiter moon Io, Hauri said. So he thinks future exploration missions to other worlds should make it a priority to investigate these deposits — and perhaps try to bring some home to Earth. "We've shown in our study that this is really the best way to get at the water content of a planetary interior, and be able to tell whether a planet is actually capable of creating an ocean or an atmosphere through volcanic processes," Hauri said. "We would really advocate pretty strongly that any sample-return mission should focus on this type of material."